Piranha & Man from U.N.C.L.E. 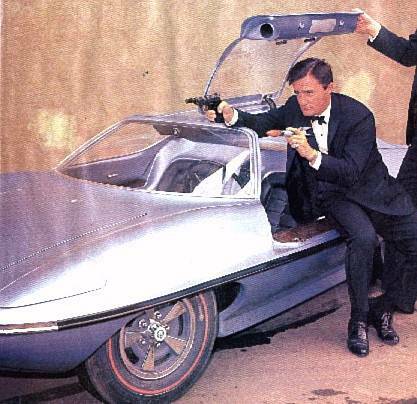 Car - Piranha "Spy Car"
Many of us remember the "Man from U.N.C.L.E." and "Girl from U.N.C.L.E." 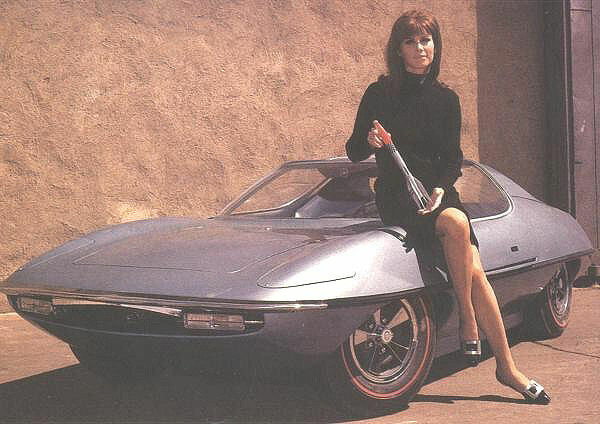 television shows from the mid-60's and the unusual car that appeared in a handful of episodes. That car was built by Gene Winfield in the AMT Corporation's "Speed & Custom Division" shop in Phoenix, Arizona. Winfield had previously built many of the Ford and Chrysler prototypes of new car designs, cars for TV, and for private customers from around the country. He was hired by the AMT model company in 1962 as a customizing consultant, and in 1964 he was asked to open a new AMT shop in Phoenix to build working, full-size versions of cars to be featured as AMT models. The partnership between AMT and the "Man from U.N.C.L.E." was actually created through Winfield, who had also been hired to build a car for the U.N.C.L.E. series. The original U.N.C.L.E. car was to be based on a Dodge Charger, but the network had second thoughts about giving them too much free advertising or perhaps cancelling their multi-million dollar advertising champaign. They decided a completely new car needed to be used. Winfield proposed a limited production car AMT was promoting, the "Piranha." NBC liked the idea, plus they loved the fact that the car could be provided at no cost because AMT would pay for its construction in exchange for the rights to produce and sell the model kit of the car. Actual construction cost of the car was between $30 - 40,000 to build, but AMT considered it a bargin since the "Man from U.N.C.L.E." show was very popular at the time. The frame of the Piranha was made of fiberglass with a steel cage housing the front and rear suspension. It had a wheelbase of 88" and was 156" long and only 41-1/2" tall. Power came from a rear-mounted Corvair engine. 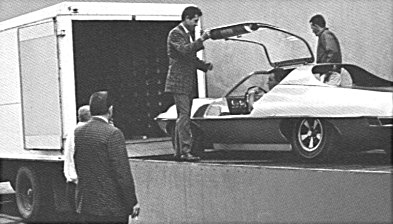 The body panels were made of Cycolac, a thermo-plastic, and featured gullwing doors. The vehicle had many mock features, including flame throwers, machine guns, rocket lauchers, laser beams, a radar screen, parachute, and various hidden interior devices. It even had operating marine propellers, but the car was not amphibious. Even though the Piranha was futuristic in design, it had everyday problems like other specialty cars. Actors Robert Vaughn (Napoleon Solo) and David McCallum (Illya Kuryakin) complained about climbing in and out and the lack of headroom, so bubble-type windows were added. "Girl from U.N.C.L.E." star Stephanie Powers (April Dancer) had her problems too. "You should have seen Stephanie try to get in and out in a skirt in those days" said George Lehr, associate producer of the series. "Trying to get up over that step and into the gullwing (door opening) in a hurry was a feat. She told us 'You guys are crazy'." Because of these problems, the car appeared in only a few episodes: "The Five Daughters Affair," "The Take Me to Your Leader Affair," "The Man from THRUSH Affair," "The Napoleon's Tomb Affair," "The Test Tube Killer Affair," and in the Girl from U.N.C.L.E. series, "The UFO Affair," which was the only time the devices were used to any extent. After the two U.N.C.L.E. 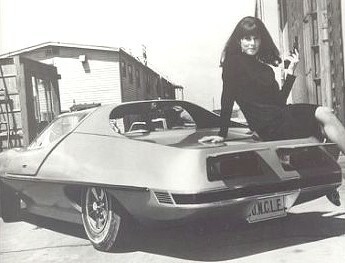 series were cancelled in 1968, the car was placed in stored and fell into disrepair. It was eventually purchased by an U.N.C.L.E. fan and restored to original condition. In 1969, Chevrolet cancelled production of the Corvair which provided power for the Piranha. Shortly after, the Piranha project was dropped by AMT and due to a recession in the plastic model business, they closed Winfield's Phoenix shop in 1970. Winfield is also responsible for other familiar TV vehicles including both the shuttlecraft and Klingon battlecruiser from "Star Trek," cars for "T.H.E. Cat", "The Hero", and a custom called the "Reactor" that appeared on "Bewitched", "Batman", and an episode of "Star Trek." Films that featured his work include Woody Allen's "Sleeper", "The Last Starfighter", and "Blade Runner." Here is a rare photo of the U.N.C.L.E. car parked next to a production Piranha. Note that the rear of U.N.C.L.E. car is a foot longer and how the roofline extends farther back. at MGM just outside a soundstage.